School has started, vacations are winding down, and it's generally a pretty stressful time as families shift into new schedules and routines. Moms especially are exhausted, even after a full night's sleep. Why is that? Oh, right, that's because our brains never stop thinking. Like, ever. This is the perfect season to give yourself a little grace, take a time-out, and do something that YOU enjoy. (Yeah, remember how you are an actual person with a name who has real hobbies and favorite things?) How on earth can we be good friends / wives / sisters / daughters / mothers if we cannot first find a sense of peace and stability in our own lives? We asked our FIT4MOM tribe for their favorite self-care tips, hacks, and treats. Get ready to take notes, mama! 1. Read an actual book — Not an iPad. Pick up a book with pages and let it take you somewhere far, far away. 2. Drink tea — When you really sit down to enjoy a cup of tea (or coffee, if that's more your jam), you are able to practice complete mindfulness. Sip and savor. 3. Create a haven — Make your bedroom your peaceful escape. Blankets, candles, comfy slippers, you name it. During naptime, mama should be able to sneak away to her very own little oasis. 4. Get a manicure or pedicure — This one is self-explanatory. Who doesn't love a good pedi?! 5. Drink water — And lots of it. Personally, I feel infinitely better on days that I drink 10+ cups of water. It boosts my mood, plus, it’s just plain good for you. 6. Get a massage — Another little splurge, but massages are like an actual "reset" button. (I think they might actually be magic.) If massage isn’t your thing, get your hair done. Buy a cute new outfit or accessory. Sometimes these little things can change our outlook on the entire week ahead. 8. 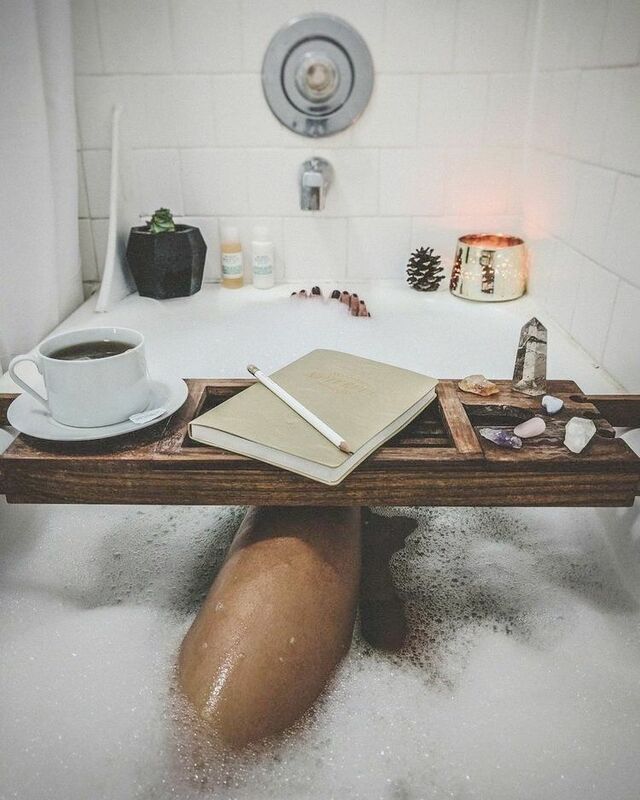 ...and then take a very indulgent bath — Use a fancy bath bomb, throw on a hydrating face mask, light some candles, put your favorite podcast on, and let the stress of the day melt away. You can't do it all, and do it well. Be picky about your schedule. Say no to things. Ask for help when you need it. Utilize your tribe. Block off dedicated "me time" each week, even if it's just a quick face mask after the kids have gone to bed! Slow down and enjoy this beautiful changing season, mama.